When an object-artifact suggests itself for inclusion in the Agincourt matrix, the question for me is obvious: How does a new thing enhance, extend, or expand the story? So, when the image below (actually only a part of the image, but this was the best I could download from eBay) showed up, I knew it was too good to pass by. Also, the price was right—about the cost of two lattes, in these parts—and it seemed more illustration than art, which meant fewer competitors. I was fortuante to be the only bidder and the piece is on its way. Now: What to make of it? An object must do one of two things for the project. It either 1) creates a new thread in the narrative, something to be woven into existing fabric, or 2) avoiding the “loom analogy” for a moment, it affords an opportunity to link parts of the story, characters or events. 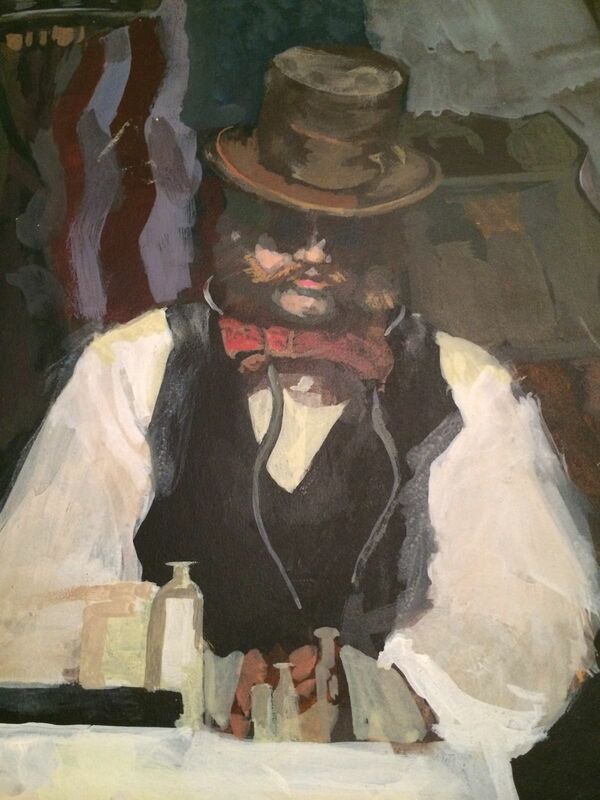 Perhaps it was the illustrative nature of “The Apothecary” that caused me to think of artist Karl Wasserman, theater director Seamus Tierney, and author-dramatist Abel Kane. How might this illustration link these three near contemporaries? 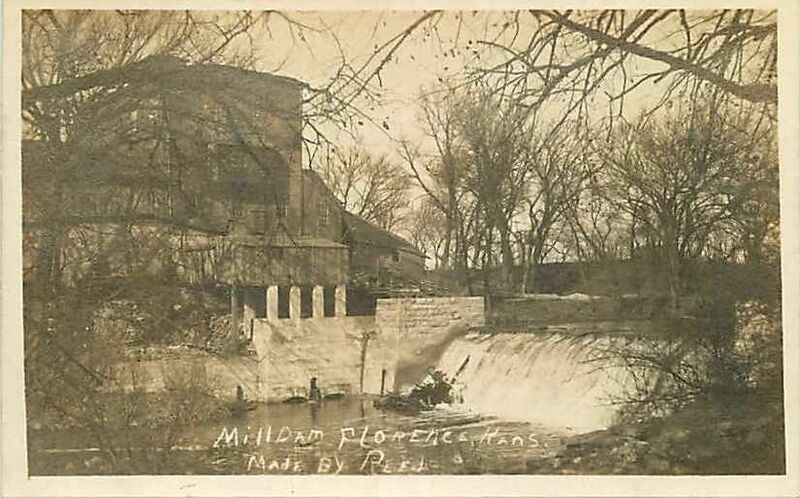 It surprised me to learn that Iowa was littered with water-powered mills in the 19th century; that they appeared even as far west as Kansas and Nebraska. So a flour mill occupying the far, western bank of the Muskrat about the time that Agincourt was platted in 1853 is hardly beyond imagining. Since many of the community’s earliest residents were emigrants from New England, New York, and the Ohio River valley, it also seemd reasonable to foresee further water-based industries in the region’s first decade or two. What grew from that was the Syndicate Mill, an 1868 co-operative establishment powered by the then steady flow of the river—more predictable than the adjacent Crispin Creek. A two-phase project seemed right: A three-story brick-and-stone building of heavy timbered “mill construction” (not unlike our own Renaissance Hall, a.k.a. 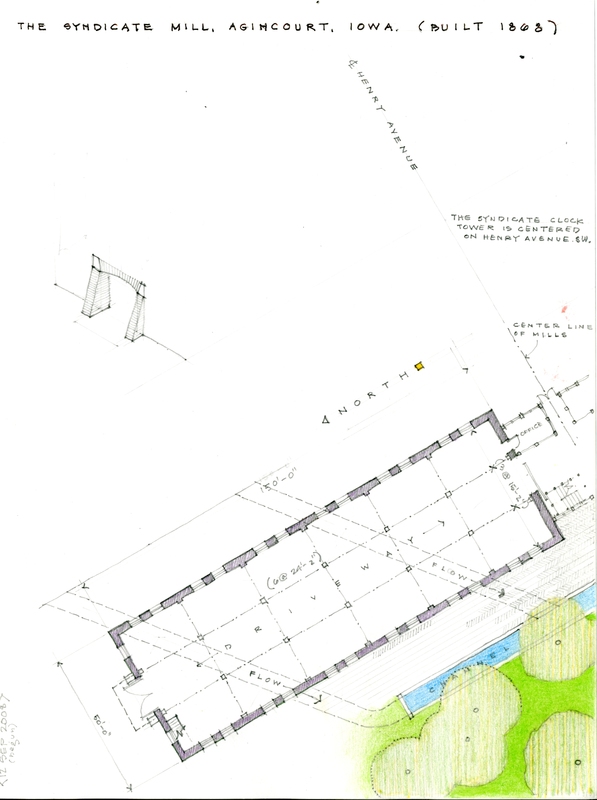 Northern School Supply) and a projected second unit of identical shape and construction, with a frame entry-office-stair and bell tower (to mark the beginning and end of the work day and also to alert the local fire company of inevitable disaster. This put me into a quick study of water wheels—under-, over-, and side-shot variants—and a likely course for the water from the mill pond to maximize power. I opted for side-shot wheels located beneath the mill buildings, to avoid icing and extend the milling season. A chance encounter with a black-and-white postcard reminded me that more than fifty years ago I had been at the Old Graue Mill in the far western suburbs of Chicago, a place built in 1852 and an obvious model for Agincourt. 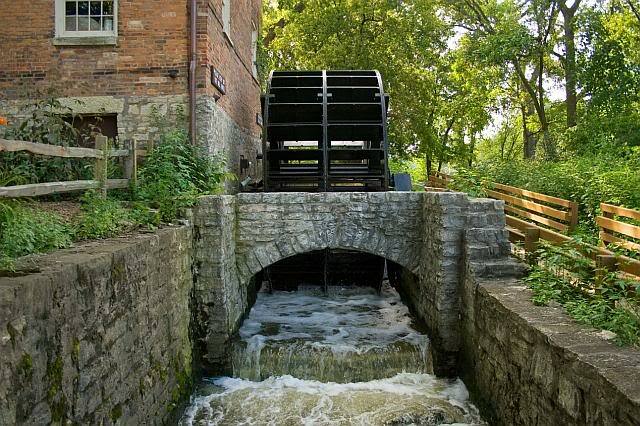 Though it’s wheel is under-shot, the mill race is typical and might be a model for development of the Syndicate. Industry is an important (some might say the most important) component of any community’s history. So your ideas and advice on later developments will be very welcome. In 1985 British author Peter Ackroyd published Hawksmoor, a novel that sold itself to me. How could it not? Eighteenth century British architect Nicholas Hawksmoor has been on my “Top Ten” since Bill Burgett told us about him in Architectural History III over fifty years ago; I was also twenty, with eclectic tastes. This was the first of several books by Ackroyd added to our shelves, which puts him in a class with Robert Harris, another of my favorite writers of fiction. So I bought the book for its title, hoping the plot might have a stronger connection than that with an eccentric architect of the short-lived English Baroque. It did and rewarded me beyond what an author might anticipate. Before trying to summarize a book I haven’t read in twenty years, let me preface a faltering memory with some words about Hawksmoor himself. The actual Nicholas Hawksmoor [1661-1736] served as Clerk of the Works to Sir Christopher Wren, honing his craft under one of the keenest British minds of his. As an apprentice of sorts, Hawksmoor superintended many of Wren’s multiple buildings, several of which were in various states of simultaneous construction during a career that included much beyond mere architecture. Later he collaborated with Sir John Vanbrugh, playwright-turned-architect, and only then produced work in his own name. Rebuilding London after the Great Fire proceeded apace with the rapidly increasing population. Parliament passed the “Fifty Churches Act” of 1711 to meet the spiritual needs of a growing city, and Hawksmoor received six of the twelve commissioned by that act. And the sequence of those six churches establishes a spine for Ackroyd’s novel: six crime scenes, twelve crimes in two centuries, because the fictionalized 18th century architect is Nicholas Dyer, and Hawksmoor serves as a 20th century Scotland Yard detective. Mysticism and the occult link the crimes in pairs, 18th and 20th century, at each of the actual Hawksmoor churches. 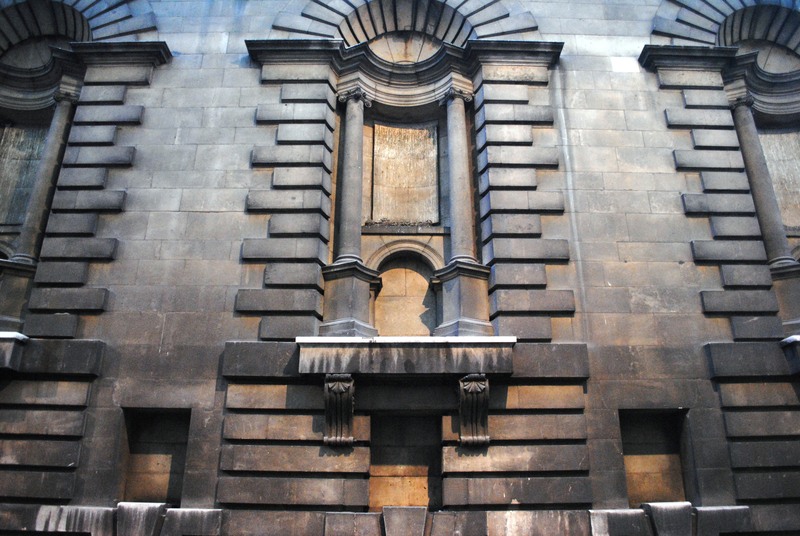 But the end of each alternating plot line—shades of Erik Larson and devil in the White City—occurs at a seventh Hawksmoor church, one that does not nor never did exist. So skillfully does Ackroyd take us to that final fatal site, along real streets and alleyways to a square of his imagining, that I saw the seventh church, one dedicated to Little Saint Hugh, in a dream one night and woke with memory so vivid I could draw it the following day. That has been and will continue to be the goal of Agincourt: narratives; stories of such familiarity and resonance that we nearly recall visiting a maiden aunt there the summer of our thirteenth year. 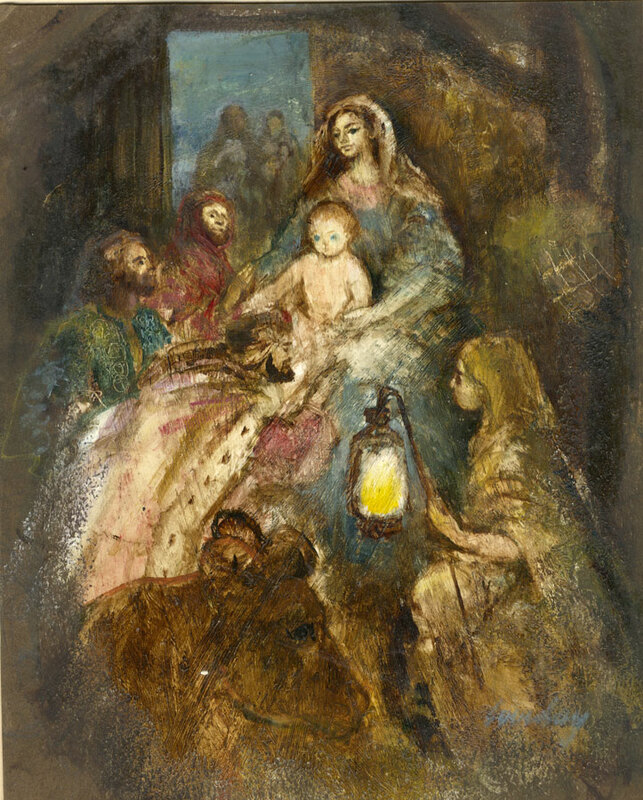 Rosalie and Derick Boothby sent this small painting as a Christmas remembrance to their friend Fr Emile Farber, priest at St Ahab’s Roman Catholic church. 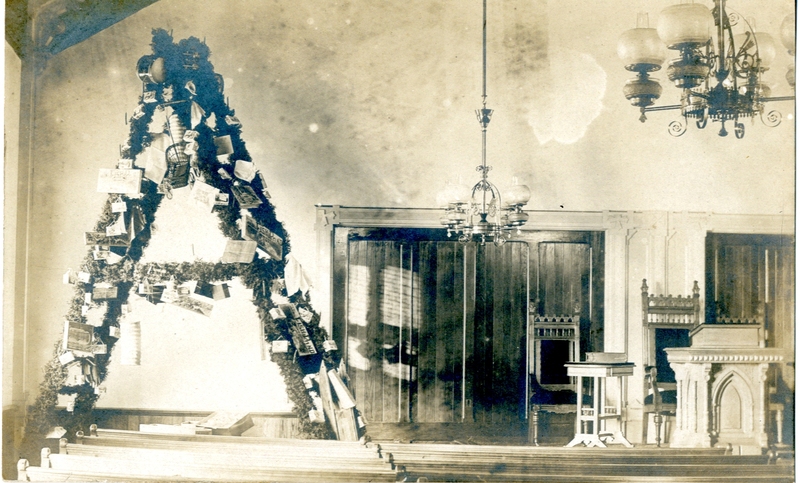 For occasions such as this traveling exhibit, the work is loaned to the Community Collection; at most other times, especially during Advent, it hangs near the confessionals at Christ the King, the Modernist church built by Farber in 1950-1951. Concerning Agincourt, I’m obviously a sucker for anything related to the letter “A”. In this case it seems to be a display of Christmas cards in church, but I’m certain we can adapt this image for some more nefarious purpose. Patience is its own reward, they say. Images of 19th century mill buildings have come and gone, but none have satisfied like this one. Is it possible we’ve found Agincourt’s 1853 flour milling facility on the river’s west bank, just above the point where the Milwaukee Road crossed on its way to Sioux City? I think so. 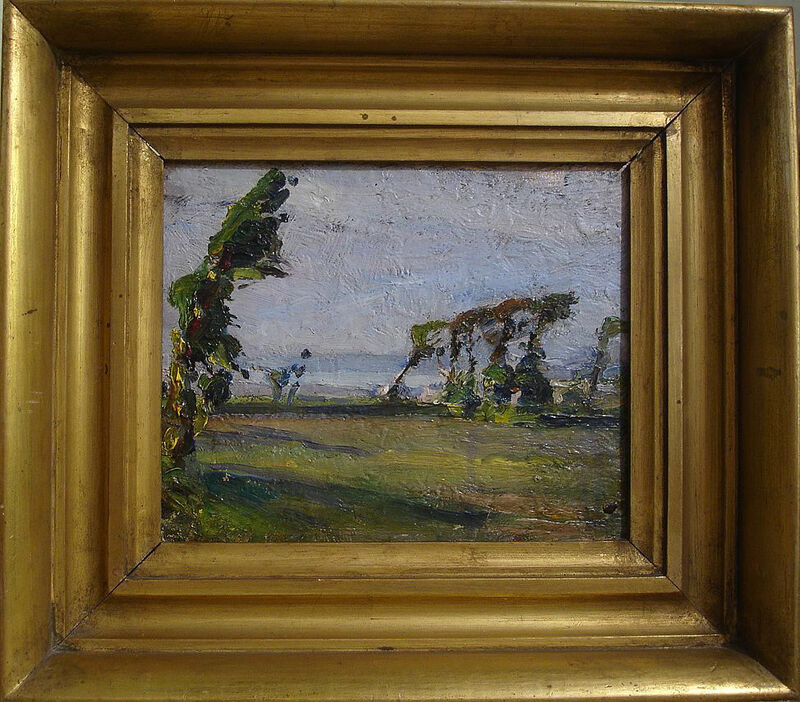 This painting came to the collection from an estate sale in Omaha. Its circumstances, apparently, went to the grave with its last owner.